A fabulous, festive stamp set from Woodware. 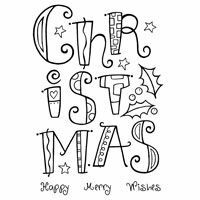 The main stamp is the word "Christmas" in a large curly font, patterns within the letters mean that you can use all kinds of colours, glitter etc. for a great effect. The stamp set also includes three smaller clear stampswith the words "Happy", "Merry" and "Wishes" that can be used in combination with the main stamp. The main stamp is 9 x 12cm or 3.5 x 5" approx.